Dr. Judith Markowitz is a lifelong Chicagoan. She's internationally recognized as a “thought leader" in the high-tech field of speech processing. She’s published over 200 articles and two books. She received the 2003 GLBT Business & Technology Leadership Award. Since coming out in the 1970s, she’s contributed to the LGBT community as a Lavender University instructor; professional musician performing at Mountain Moving Coffeehouse, Lesbian Writers Conferences, and LGBT events; reviewer for Lambda Book Report; and lecturer at Gerber/Hart Library. She wrote The Gay Detective Novel and is Secretary of the Board of the Lambda Literary Foundation. She met her life partner, Susan Franz, in 1980. Susan Franz is a certified financial planner professional with twenty-plus years experience specializing in tax-related planning and investments. Over one quarter of her clientele is LGBT. She made Chicago her home in 1969. Franz and her gay twin brother grew up downstate. She was president of the Associated Women Students of Illinois State University. Although she came out around age nine she was closeted until after meeting her life partner, Judith Markowitz, in 1980. Today, she’s an HRC donor and supports other LGBT organizations. 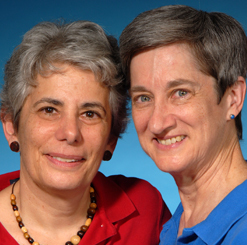 Susan and Judith won a silver medal in the dancesport competition of the Chicago Gay Games.